You are Buying : 1999 Upper Deck New York Jets Football Card #151 Keyshawn Johnson F-3. We want to provide a great buying experience for you. KEYSHAWN JOHNSON. 1996 UPPER DECK COLLECTORS. FOOTBALL CARD #1. CARD IS IN A SOFT PLASTIC, INSIDE OF A HARD PLASTIC. This card is serial numbers 12 out of 25. Please ask questions before bidding! 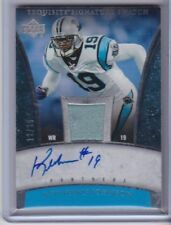 I am in no way a sports card expert, grader or signature expert! Card pictured is what you will get! (WYSIWYG) Payment must be received within 48hrs. Or item will be relisted, appropriate feedback will be left and eBay will be notified International buyers will pay actual shipping cost! Please get a quote or contact me for shipping cost! Thanks for looking!! You will receive the actual card shown. 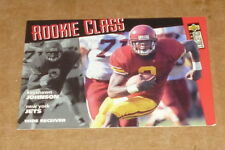 1996 Upper Deck SP Keyshawn Johnson Rookie football Card #1 that is in NM/M Condition. This card sports sharp corners, clean edges, nice surface front and back, and great centering. You will enjoy owning this Football card gem that is in collectible condition. Item#: GS7. Player: Keyshawn Johnson. Set: 2000 Upper Deck Gold Reserve Gold Strike. Manufacturer: Upper Deck Co. Year: 2000. Sport: Football. Set: 1996 SP Holoviews. Player: Keyshawn Johnson. Team: New York Jets. Year: 1996. (Player: Keyshawn Johnson. Set: 1998 UD3. Team: New York Jets. Item#: 219. Year: 1998. WE WANT TO BE YOUR SOURCE FOR LARGE CARD QUANTITY ORDERS! 2) INTERNATIONAL ORDERS. NO RESTRICTIONS - MIX and MATCH!! KEYSHAWN JOHNSON. 2001 UPPER DECK MVP. See scans for condition. NRMT or better in my opinion. Player: Keyshawn Johnson. Set: 2002 Upper Deck XL Super Swatch Jerseys Grey Background. Manufacturer: Upper Deck Co. Year: 2002.